ORANGE CITY - Members of the state of Dakota yesterday morning have over 15 years in prison received. 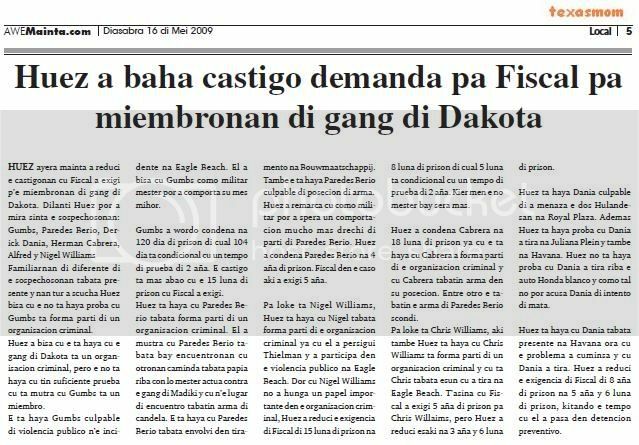 The court found that the gang actually part of a criminal organization, which the 'gang of Dakota as the first on the island formally appointed as a judge. Almost all suspects - except one - were convicted of membership of a criminal organization. Derrick Dania is convicted of attempted manslaughter, possession of firearms and threats. He had received 5.5 years imprisonment imposed. The prosecutor had demanded eight years. Ex-military Luis Paredes Berio was his involvement in three shootings sentenced to 4 years in prison. The DA had against him 5 years required. To be announced directly to his lawyer did not agree to the punishment and will be reviewed. Alfred Christopher Williams was sentenced to 3.5 years in prison for attempted murder and firearm possession. His sentence was 1.5 years lower than the requirement of the OM. Hermain Cabrera was yesterday sentenced to 1.5 years in prison for multiple violations of firearm regulation. 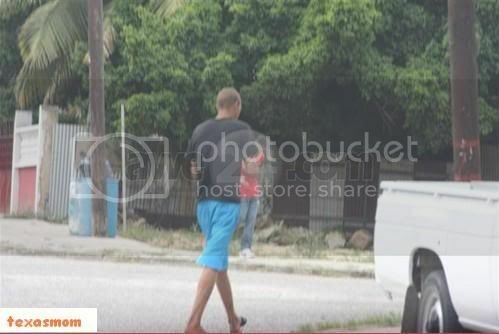 Nigal Williams, younger brother of Chris Williams was sentenced to 8 months cell for public violence. He was less pre-trial immediately after the verdict home. He was 15 months required. Ex-military Kenneth Gumbs was not only convicted of membership of a criminal organization. However, he was found guilty of public violence. Because Gumbs some time in pre-trial has been was after the decision to release states. Michael Williams, father of the Williams brothers, after the ruling would have immediately announced an appeal to proceed. The prosecutor has not wanted to respond to the case. On the questions or to be satisfied and if an appeal is made he does not respond. As a precaution yesterday morning there were many policemen on the leg at the courthouse. Employees Cuerpo Especial Arubano (CEA) were prominent. During an earlier treatment of this case was in a scuffle between CEA, Nigel Williams and a few outsiders. Advance was there that related to security, the outcome of KIA would take place. The decision was however in the court, and went quietly. ORANGE CITY - The trial against Eugene Lampe, accused of triple murder, was yesterday postponed again. It was not because the psychiatric report of the Pieter Baan Centrum (PBC) is still away. PBC is the psychiatric observation clinic Dutch Institute for Forensic Psychiatry and Psychology. Lampe was here for observation in order to determine the responsibility. The man is suspected on from April 4 last year his mother, father and brother are killed to have. According to the court the case was delayed due to a misunderstanding between the court commissioner, the prosecutor and lawyer. A quiet Lampe took yesterday afternoon around a quarter to two on the benches in the court. Here he was told that the trial will be adjourned to July 3 in connection with overloading of the team of PBC. The clinic in the Netherlands has indicated that in two months hopefully answer can be given to the questions related to Lampe's mind by the judge asked. The suspect asked yesterday whether he is in the intermediate time was left. The court asked defendant where he would stay. Then gave Lampe replied that he would stay with his brother. The judge rejected that request because he "was a step too far." Lampe also said that he is very difficult in KIA partly because he can not to continue with his celgenoot. 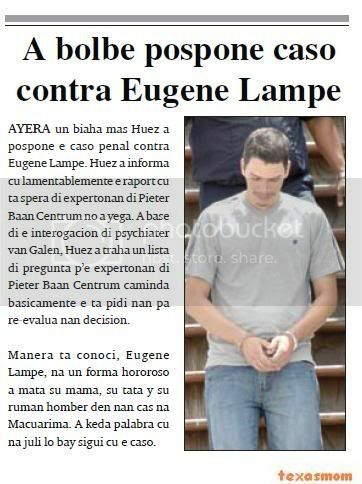 Thus Lampe's celgenoot he deliberately urinate in his cell. "I would like to see us apart. I also want to Holland for treatment to be taken. " This situation, the court that the case should be handled first and then the possibilities by the prosecutor determined. In the meantime, Lampe remains so stuck in prison KIA. diahuebs morning hour cu trahadornan of one compania of carga, gasa owing to present at trabao owing to descubri cu they owing to ricibi visit indesea. the ladronnan owing to break till even the candal where the part ey is seya cu douane have aceso at dje. diahuebs morning hour cu trahadornan of one compania of carga, gasa owing to present at trabao owing to descubri cu they owing to ricibi visit indesea. the ladronnan owing to probecha by of enter via one part in construccion y renobacion y just in the part ey not had coriente, then the sistema of seguridad not was funcionando y so had all they time for comete they ladronicia. they owing to break various box of mercancia y pertenencianan owing to break candal y open door big of the deposito for owing to using one forklift of the lugar for actuate carga pafo y so succeed bay cu one great cantidad of perfume y another mercancianan cu they have to revisa still for know kico they owing to bay cune. the ladronnan owing to break till even the candal where the part ey is seya cu douane have aceso at dje. one list of inventory will being entrega at police p’asina saca afor kico all the ladronnan owing to bay cune. 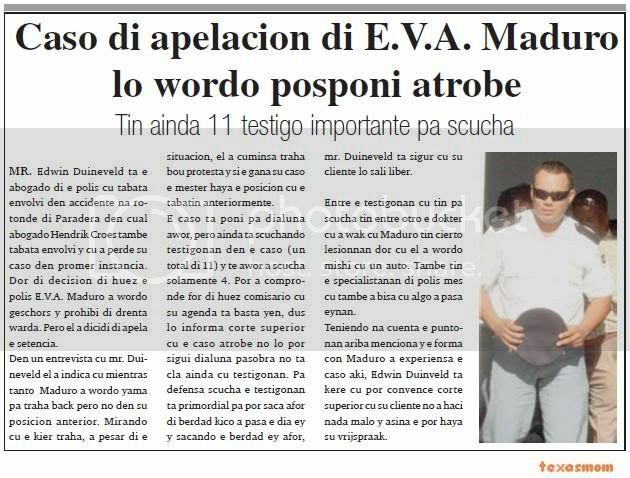 mr. edwin duineveld is the advocate of the police cu was envolvi in accidente at rotonde of paradera in cual advocate hendrik croes also was envolvi y cu owing to lose his caso in previous to instancia. by of decision of huez the police the.v.a. maduro owing to wordo geschors y prohibi of enter keep. 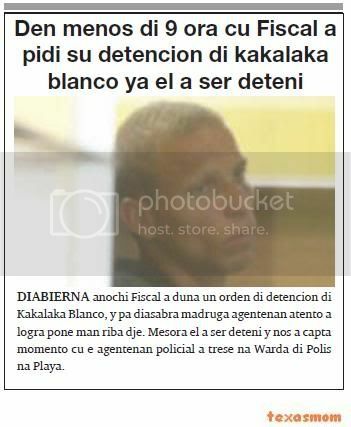 but past owing to dicidi of apela the setencia. in one interview cu mr. duineveld past owing to indica cu all the time maduro owing to wordo calling for work back but not in his posicion anterior. mirando cu the wanted work, owing to pesar of the situation, past owing to cuminsa work under protest y if the earn his caso the have to achieve the posicion cu the had anteriormente. the caso is poni for monday now, but still is scuchando testigonan in the caso (un overall of 11) y till now owing to listen only 4. can owing to compronde for of huez comisario cu his agenda is enough complete, dus will informa corte superior cu the caso again not will can follow monday because do not cla still cu testigonan. for defence listen the testigonan is primordial for can saca afor of berdad kico owing to happen the day ey y sacando the berdad ey afor, mr. duineveld is assure cu his cliente will leave pound. among the testigonan cu have for listen have among another the doctor cu owing to look at cu maduro have cierto lesionnan by cu past owing to wordo touch cu one car. also have the specialistanan of police self cu also owing to tell cu algo owing to happen eynan. teniendo at cuenta the puntonan upstairs menciona y the form con maduro owing to experiensa the caso here, edwin duinveld is believe cu can convence corte superior cu his cliente not owing to haci nothing bad y so the can achieve his vrijspraak. is much person owing to become feliz hour cu owing to hear cu police owing to detene several person encarga cu one organizacion of steal car. but so self owing to stay much ladronnan of car more on caya, already cu autonan is follow wordo steal. diarazon nightfall autoridad owing to succeed achieve informacion of cu in the mondinan of series teishi have 3 car full pluma let behind. police owing to ask takelwagen for take away thing owing to stay of the autonan here keep of balashi for more investigacion. diahuebs morning owner of one car owing to leave pafo of his cura y owing to look at cu the glass of behind his car is break. y hour past owing to look at in his car past owing to ripara cu ladronnan owing to steal his car-stereo y speakernan. according his declaracion, this not t’e first trip, but the is find odd cu they owing to break the glass, already cu ladronnan have costumber of break his car for bay cu the radio the is let this open. diahuebs morning early ladronnan wanted owing to break enter for steal in one business in elleboogstraat, esta all in one. 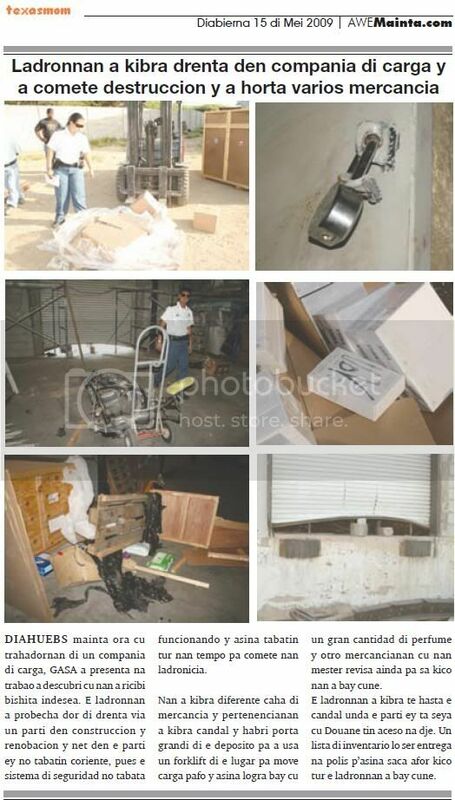 they owing to forza y break the door of iron of the business for after break the glass. but hour cu they wanted owing to bay enter the alarma owing to enter in funcion y n’e momentonan ey one guardia owing to aserca y owing to see the ladronnan core bay without cu they can owing to enter in the lugar. then they not owing to succeed bay cu nothing. the business here, all in one is stay stick cu shelter roof on cabez. 08.30 m.r.p. g.j.p. m.p. y g.p. is wordo acusa of ladronicia of pertenencianan of one person on 20 of feburary 2009. 09.30 f.d.g. 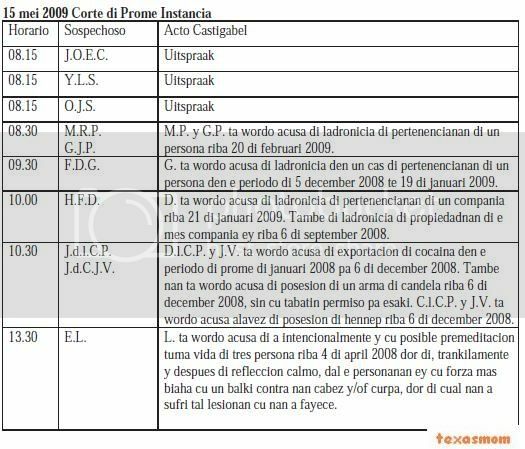 g. is wordo acusa of ladronicia in one cas of pertenencianan of one person in the period of 5 december 2008 till 19 of january 2009. 10.00 h.f.d. d. is wordo acusa of ladronicia of pertenencianan of one compania on 21 of january 2009. also of ladronicia of propiedadnan of the self compania ey on 6 of september 2008. 10.30 j.d.l.c.p. j.d.c.j.v. d.l.c.p. y j.v. is wordo acusa of exportacion of cocaina in the period of first of january 2008 for 6 of december 2008. also they're wordo acusa of posesion of one arm of candela on 6 of december 2008, without cu had permission for this. c.l.c.p. y j.v. is wordo acusa alavez of posesion of hennep on 6 of december 2008. 13.30 the.l. l. is wordo acusa of owing to intencionalmente y cu posible premeditacion take vida of three person on 4 of april 2008 by of, trankilamente y after of refleccion calmo, strike the personanan ey cu forza more trip cu one beam contra they cabez y/of curpa, by of cual they owing to abide such lesionan cu they owing to fayece. 08.15 the.e.d.c. de c. is wordo acusa of cu the intencion of take life of one person on 23 of december 2008, owing to trankilamente y after of refleccion calmo, hinca the person ey several trip cu one sker at various part of his curpa. pro form. 08.30 r.r.v. v. is wordo acusa of transporte y/of posesion of cocaina on 30 of september 2008. 08.30 c.a.f.f.m. r.a.a.a. f.f. y owing to.a. is wordo acusa of, conhuntamente cu others or one another, entrega y/of transporte y/of posesion of cocaina on 20 of october 2008. f.f. y owing to.a. is wordo acusa also of posesion of hennep in the period of first of september 2008 till 20 oktober 2008. owing to.a. is wordo acusa alavez of, conhuntamente cu others or one another, entrega, transporte y/of posesion of cocaina on 30 of september 2008. 08.30 b.m.c. m.c. 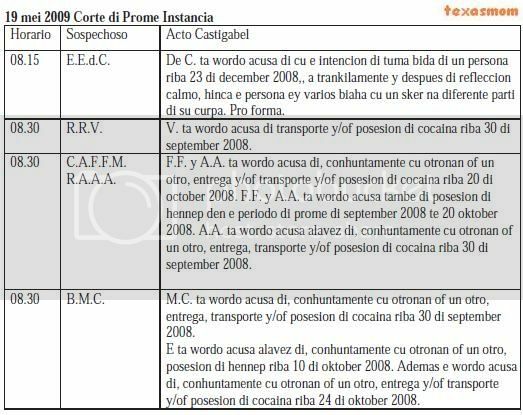 is wordo acusa of, conhuntamente cu others or one another, entrega, transporte y/of posesion of cocaina on 30 of september 2008. the is wordo acusa alavez of, conhuntamente cu others or one another, posesion of hennep on 10 of oktober 2008. besides the wordo acusa of, conhuntamente cu others or one another, entrega y/of transporte y/of posesion of cocaina on 24 of oktober 2008.
michael williams was yesterday in corte for listen veredicto on his child, that owing to achieve one castigo of 3 year y mey. in interview cune past owing to tell cu is tristo cu one boy cu is at flower of his life, cu have cu bay study is achieve various declaracionnan false contra dje, declaracionnan cu owing to wordo hinca now here. supuestamente one such lisa owing to give declaracion cu the child have arm. “mi is believe cu top of police, my wanted bay cu name, candelaria, hodge, carlo cornelio, v.d. schaft, i am believe cu if berdaderamente we wanted one cambio at aruba mihor we cuminsa fix in the sistema hudicial, fix where cu the appelnan putrefy is. tomorrow is lever on plane mos v.d. schaft y others y is let we lugar destrui. i am believe cu for we this is haci we one bit more strong. for my yiunan i am believe cu they have to learn one lesson of this of not confia in amigo. is that is do you amigo? esey do you have to ask about do you self awe”, michael williams owing to give of conoce. on the question if the is believe cu the because; parent can owing to abort mirando cu this is of two trip cu his child is cay close, past owing to tell cu because; deportista, because; cu the is in the organo more high in sport y all cu conoce in dakota y rond aruba, all family is help big y diminutive, poor y rico, drogadicto…pa they not have diferencia. “faya…faya con? of where? i have cria my yiunan y i am believe i have crianan bon”. also past owing to tell cu can is they can using the caso for stroba michael bay fast, but the is tell cu one man bashi can is dangerous, but have to as cuidou cu one man of coin. 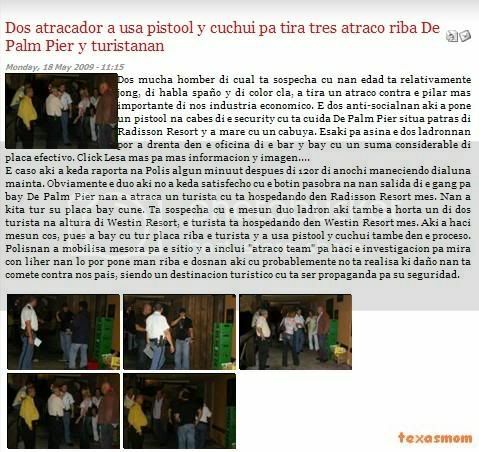 diahuebs nightfall again can owing to see cacalaca blanco, the conocido of police was happen cas for cas in dakota y tarabana bendiendo dvd probably steal. bisiñanan y comunidad is coopera cu husticia mandando all type of informe, but is seems cu husticia self do not coopera cu comunidad y is let the sospechosonan here in freedom. we not know if is because the is dutch european, the have tanto suerte so! but mature is cu is several trip end the is being deteni for police, but of one or another form the is being let in freedom casi at once. week happen diabierna owing to ask his buskeda y detencion y owing to being deteni saturday madruga, but already the week here the is afo end. believe it or not! diabierna during madruga polisnan attentive, pasando in bushiri owing to notice one nissan sentra blanco sospechoso scondi in the forest. at once they owing to arrive serca y owing to descubri cu here is deal of one car procedente of ladronicia. 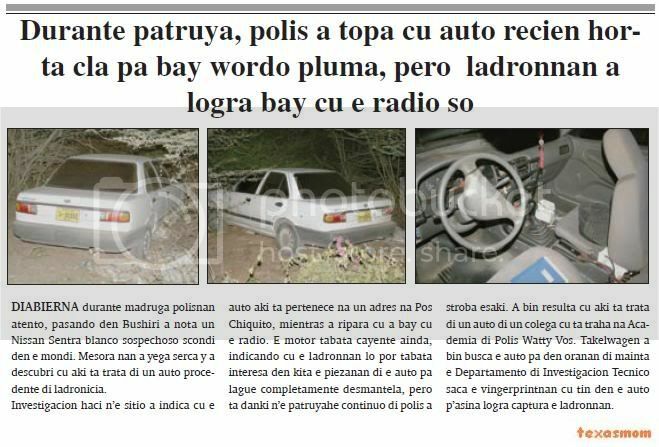 investigacion haci n’e sitio owing to indica cu the car here is pertenece at one adres at pos chiquito, while owing to ripara cu owing to bay cu the radio. 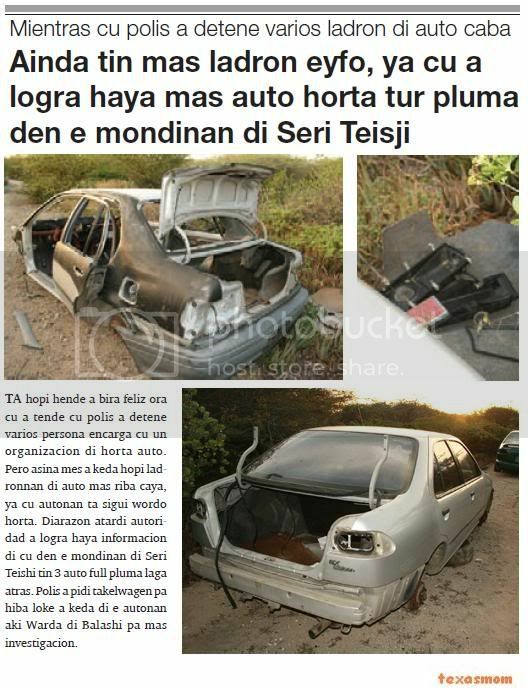 the engine was cayente still, indicando cu the ladronnan will can was interesa in less the piezanan of the car for lague completamente desmantela, but is thanks n’e patruyahe continuo of police owing to stroba this. owing to come resulta cu here is deal of one car of one colega cu is work at academia of police watty voice. takelwagen owing to come busca the car for in oranan of morning the departamento of investigacion tecnico saca the vingerprintnan cu have in the car p’asina succeed captura the ladronnan. yesterday once more huez owing to pospone the caso penal contra eugene lampe. huez owing to informa cu alas the raport cu is wait for of expertonan of pieter baan centrum not owing to arrive. owing to base of the interogacion of psychiater van galen, huez owing to work one list of question p’e expertonan of pieter baan centrum caminda basicamente the is ask they for re-evalua they decision. as is conoci, eugene lampe, at one form hororoso owing to kill his mother, his father y his brother man in they cas at macuarima. owing to stay word cu at july will bay follow cu the caso. 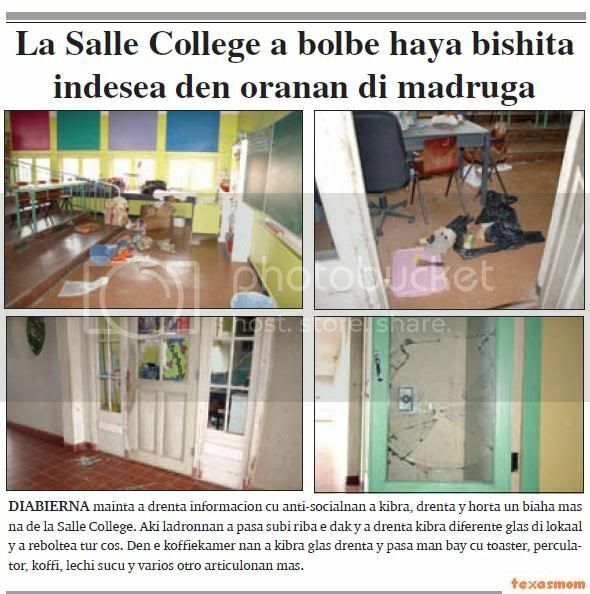 diabierna morning owing to enter informacion cu anti-socialnan owing to break, enter y steal once more at de la salle college. here ladronnan owing to happen lever on the roof y owing to enter break various glass of lokaal y owing to reboltea all cos. in the koffiekamer they owing to break glass enter y happen hand bay cu toaster, perculator, koffi, milk sugar y several another articulonan more. 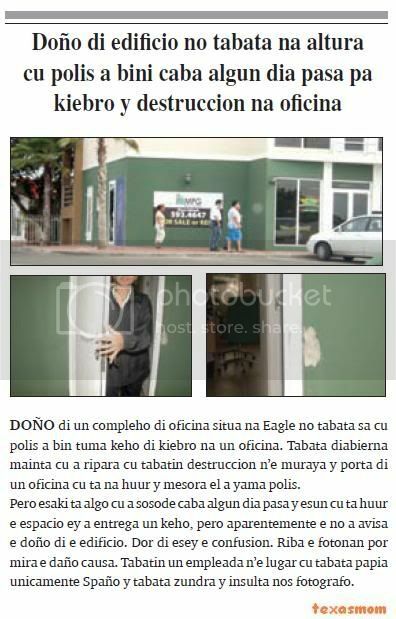 owner of one compleho of office situa at eagle not was know cu police owing to come take complaint of kiebro at one office. was diabierna morning cu owing to ripara cu had destruccion n’e wall y door of one office cu is at huur y at once past owing to calling police. but this is algo cu owing to sosode end some day happen y esun cu is huur the espacio ey owing to entrega one complaint, but apparently the not owing to avisa the owner of the edificio. by of esey the confusion. on the fotonan can see the damage cause. had one empleada n’e lugar cu was talk unicamente spanish y was zundra y insulta we fotografo. 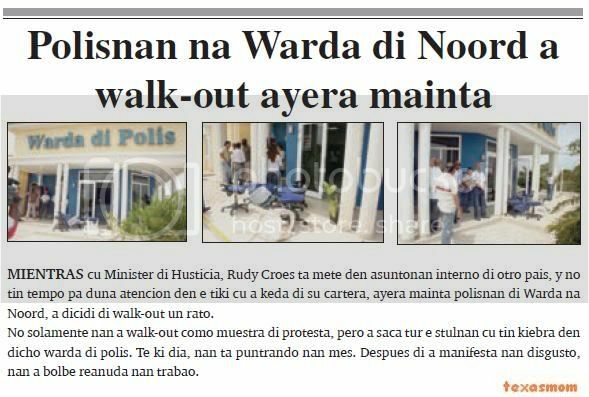 yesterday morning while cu minister of husticia, rudy croes is mete in asuntonan inner of another country, y not have time for give atencion in the bit cu owing to stay of his cartera, yesterday morning polisnan of keep at north, owing to dicidi of walk-out one rato. not only they owing to walk-out because; sample of protest, but owing to saca all the stulnan cu have kiebra in dicho keep of police. till what day, they're puntrando they self. after of owing to manifesta they disgust, they owing to go back reanuda they trabao. diabierna morning hour owner of one cas owing to bay for saca his car for of garage, the is come achieve one choller sleep at big y does not owing to actuate for nothing of world. past owing to calling police y hour the choller owing to look at uniform of police at once past owing to arise y owing to actuate. police owing to dune one scual y owing to advirti’e cu at one proximo ocasion the ripiti the acto ey police will deal more pisa cune. the muher or.g. 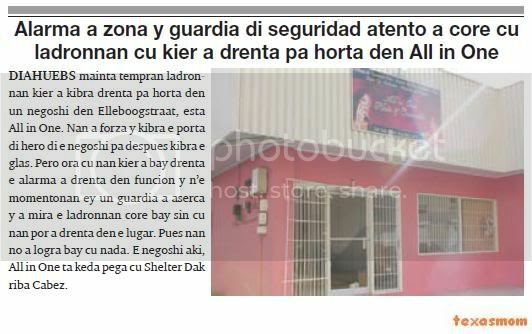 naci at aruba of 35 year, is ask presencia of police, one cas at nijhoffstraat, because; cu one choler owing to enter in his car y owing to bay cu bag cu contenido. or.g. is count ; police cu past owing to arrive his cas 3.30 of madruga, y owing to let the car open one rato p’e descend one person for of car y yude enter in cas. one another person cu was together cu they, owing to bay for close the car, but owing to come across cu one man sit in the car y is busca cos for steal. hour cu he owing to see the person, past owing to coy one bag cu was in the car y past owing to core bay. in his bag the had one cartera cu 400 guilder more 40 dollar, also the had his carchi bancomatico, rijbewijs, spectacles, key of cas, two relefon. 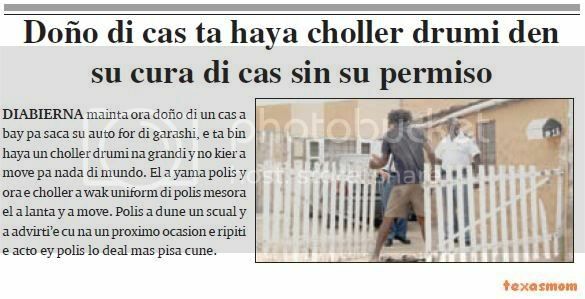 the person owing to give police descripcion of the thief cu have aparencia of one choler. police owing to busca in becindario, but not owing to come across cune. 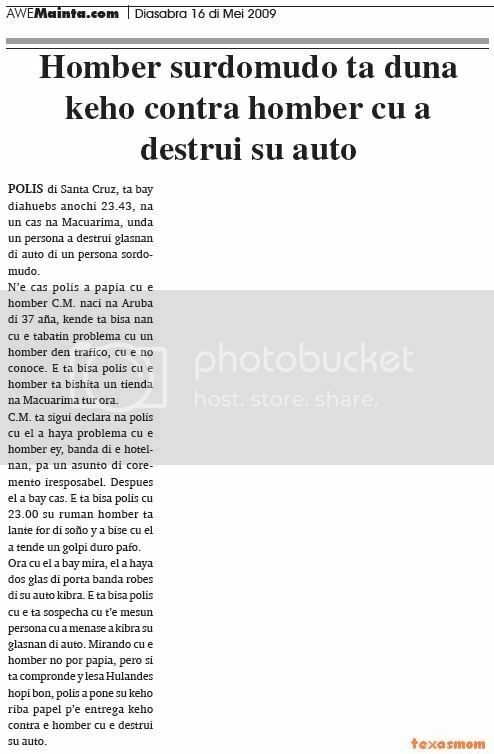 police of santa cruz, is bay diahuebs night 23.43, at one cas at macuarima, where one person owing to destrui glasnan of car of one person sordomudo. n’e cas police owing to talk cu he c.m. 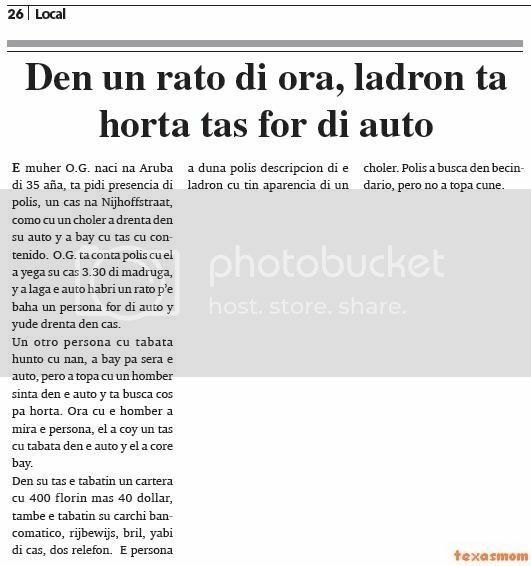 naci at aruba of 37 year, that is tell they cu the had problem cu one man in trafico, cu the not conoce. the is tell police cu he is visit one store at macuarima all hour. c.m. is follow declara at police cu past owing to achieve problem cu he ey, near of the hotelnan, for one asunto of coremento iresposabel. after past owing to bay cas. the is tell police cu 23.00 his brother man is lante for of dream y owing to bise cu past owing to hear one golpi duro pafo. hour cu past owing to bay see, past owing to achieve two glass of door near left of his car break. the is tell police cu the is sospecha cu t’e same person cu owing to menase owing to break his glasnan of car. 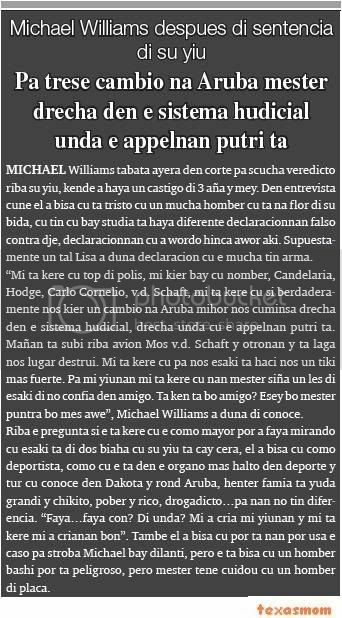 mirando cu he not can talk, but if is compronde y read dutch much good, police owing to place his complaint on paper p’e entrega complaint contra he cu the destrui his car.